You know, it’s somewhat confusing to notice that Finnish duo Oath do not release their newest creation via Patologian Laboratorio Recordings. The latter is a label run by Aki ‘Grim666’ Klemm, who is part of many projects and bands that release their stuff via that label especially – think Kalmankantaja, Lathspell, Grimirg, Order Of The White Hand and many more. I recommend to enter this label’s name in the ‘search’-tab on top to find out what this guy and his label have to offer (it’s truly impressive), and in the next days / weeks, I will upload several reviews for new stuff, kindly offered to the audience by this guy. On that label’s roster too are some projects by Ville ‘V-Khaoz’ Pallonen, such as v-KhaoZ itself, as well as, for example, Hiisi. He’s part of the Kalmankantaja line-up too, by the way. These two guys, Grim666 and V-Khaoz, are the core members of Oath, but they release their newest work via another label, being Belgian finest Immortal Frost Productions. But then again, it isn’t that strange, for there were some other Oath-releases released via Immortal Frost Productions before. Here too it would be an opportunity to check out the reviews that were published in the (recent) past: the full length Saatanan Myrsky Yllä Pyhän Maan and the split with Azaghal, posted on the updates of July 21st 2014 and February 27th 2016 respectively. And then again, some other projects these guys are involved with, are on that Belgian label (like Hautakammio), so there is for sure an unholy collaboration in between all of them. Pfff… Quite a long introduction, so let’s get to the point. 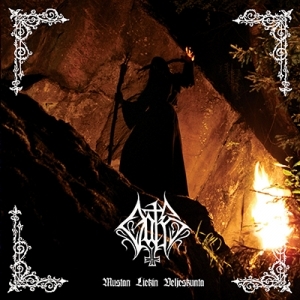 Mustan Liekin Veljeskunta was recorded in 2015 at Aki’s Patologian Laboratorio Studio by Grim666 (guitars, bass and vocals) and V-Khaoz (drums and additional keyboards). It’s a five-tracker that clocks thirty-seven minutes, being released in an edition of 1,000 copies. Opener Aamutähden Poika starts with a cold two-minute intro, before crawling out of the grave. As from then on, I feel like being back in the Nineties – and that’s a good thing, if you ask me! Oath’s performance is quite ‘Scandinavian’ in both execution and sound, yet it goes further than the traditional ‘Nordic’ trend. Actually, this two-man army defines the supremacy of the Suomi-based scene rather than one that refers to the Norwegian or Swedish one. It maintains the grim elegance of the cold Northern scene from two decades ago, but the addition of the few synth lines are an element that is distinctive from the vast majority of the scene. But there are more exceptional details. I am not referring to the fabulous song writing or the impeccable performance. Actually, it’s stuff like the variety in speed (quite energetic in essence, yet injecting much more slower passages than before, sort of stimulating the obscure character of the recording), or the excellent production (seriously, it is superb, after my disappointment with the material on the split with Azaghal), that are top-notch. But then again, one (and ‘one’ is: those being decent, honest, devoted reviewers) cannot but feel the urge to mention the superior drum play, those mesmerizing keyboard lines, the purely Arctic vocals, or the great guitar melodies with that epic attitude. I did like the roughness of the debut and the split, and on this second full length everything might seem little more ‘prepared’, polished. I do not think that this is a negative evolution, for it shows the permanently evolution of two great composers / performers. Therefore, once again, I do recommend Oath to the dark-minded souls amongst us!